2. Grate the cabbage and carrot and mix thoroughly in a bowl with the cranberries and chopped dill and coriander. 3. Place the zest and juice of the lemons into a large mixing bowl. Add the olive oil and balsamic vinegar and whisk thoroughly. Pour over the cabbage and carrot and mix well. 4. 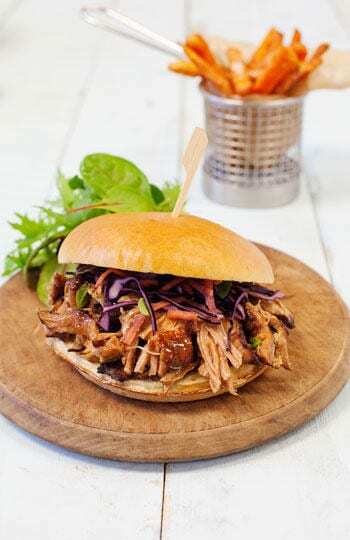 To assemble, toast the glazed bun and top with some of the warm pulled pork mix. Add the slaw to the pork and top with the remaining toasted bun and a little BBQ sauce.